This week the Public Relations Society of America (PRSA) International conference is being held in Philadelphia which is the largest organization for PR professionals. 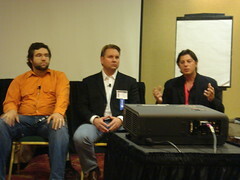 TopRank Online Marketing CEO, Lee Odden participated on a panel called “Social Media, What Every PR Practitioner Needs to Know” moderated by Peter Himler and with Rob Key, Lee and Nicco Mele on the panel. Peter Himler started out the session by having the panel introduce their company’s services and specialties. The panel then offered their thoughts on how PR practitioners can and should leverage social media. Rob Key’s work ranges from search marketing to PR to virtual worlds. His company, Converseon, recently won an OMMA Award for “Second Chance Trees“, a virtual world project directed towards promoting reforestation both virtually and in the real world. As the webmaster for the online campaign website for Howard Dean, Nicco Mele discussed his company’s expertise at building communities online. TopRank Online Marketing CEO, Lee Odden gave insight into how search marketing affect PR and social media. Important concepts discussed and previously published at Online Marketing Blog include: Push and Pull PR, holistic content optimization, top down keyword messaging with all digital communications, digital asset optimization and the effects both on influencing search results in a Universal Search environment as well as creating direct interaction opportunities with distinct search channels. The remaining portion of the session involved the moderator offering questions to the panel as well as taking several questions from the audience ranging from “How do I comment on a blog” to asking for examples of how to leverage social media for reputation management. The session was a success and received overwhelming positive feedback. This topic will only grow in importance over the coming year if not for the momentum of so many PR and media relations practitioners getting involved, but for the pressure managers and clients will be putting on their PR agencies to help them figure out where social media fits (if at all) within their PR strategy. Photos are available on Flickr for the PRSA conference and the official conference blog is publishing multiple stories per day. Rich Brooks of Voce and publisher of the Hyku blog is also publishing photos of the PRSA conference. 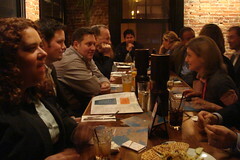 The day ended with a blogger dinner at Marathon Grill where great food and conversation were had by all. This entry was posted on Tuesday, October 23rd, 2007 at 5:15 pm	and is filed under PR Conferences, Public Relations. You can follow any responses to this entry through the RSS 2.0 feed. You can leave a comment below.